The bush seemed too weak to support the pileated woodpecker’s (Dryocopus pileatus) size and heft. 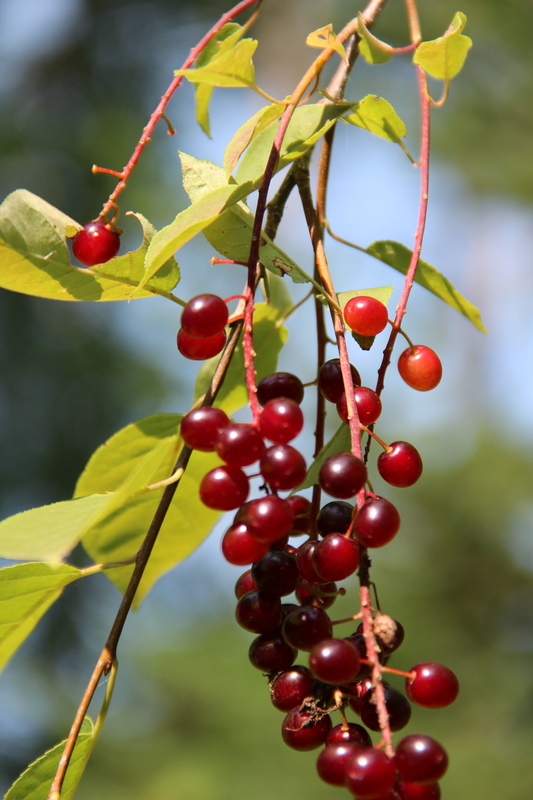 Catbirds, robins, chipmunks and squirrels easily picked the ruby and purple fruit from the spindly chokecherry branches. But, the crow-sized woodpecker struggled to alight and balance in the bush. 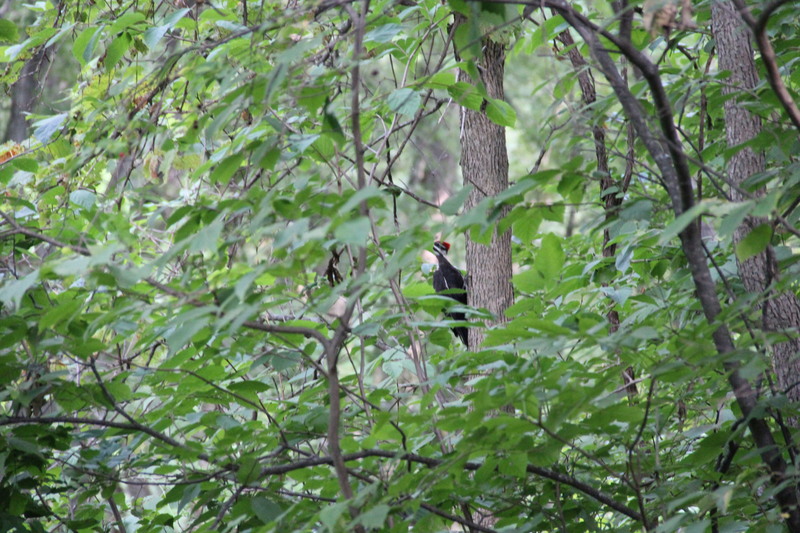 Its black forehead and mustache stripe identified this pileated as being a female. First, she flew straight into the bush, but the branches bent and sank under her weight. Next, the woodpecker landed in each of the bur oak trees that flank the chokecherry and then dropped into the bush; still unsuccessful. When we returned to our cabin on the Snake River the following weekend, she had solved the problem. 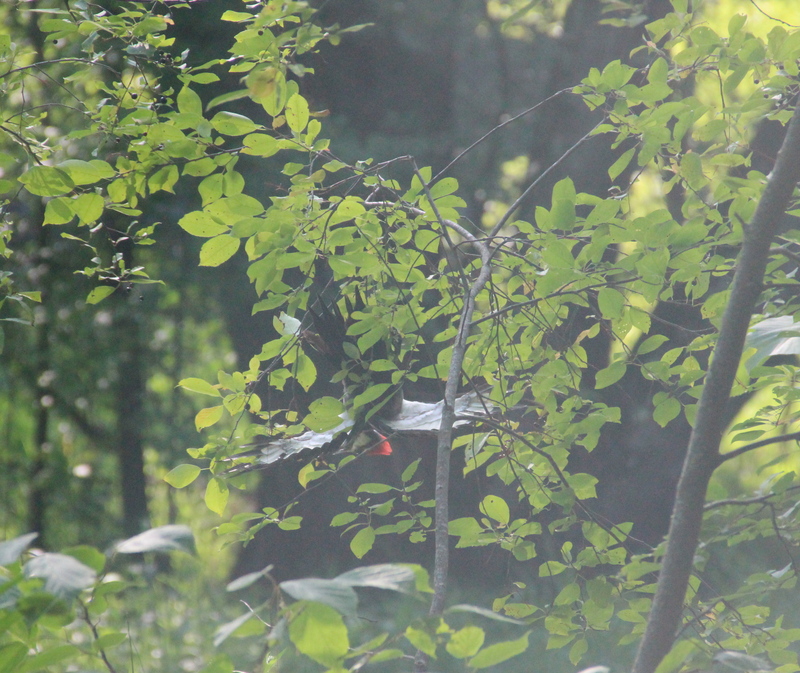 Sometimes the pileated used her wings and tail to brace herself — even hanging upside down. At other times, she seemed to pluck the fruit from midair. The beauty of her wings unfurled in waves of ivory and black that thwacked the air. 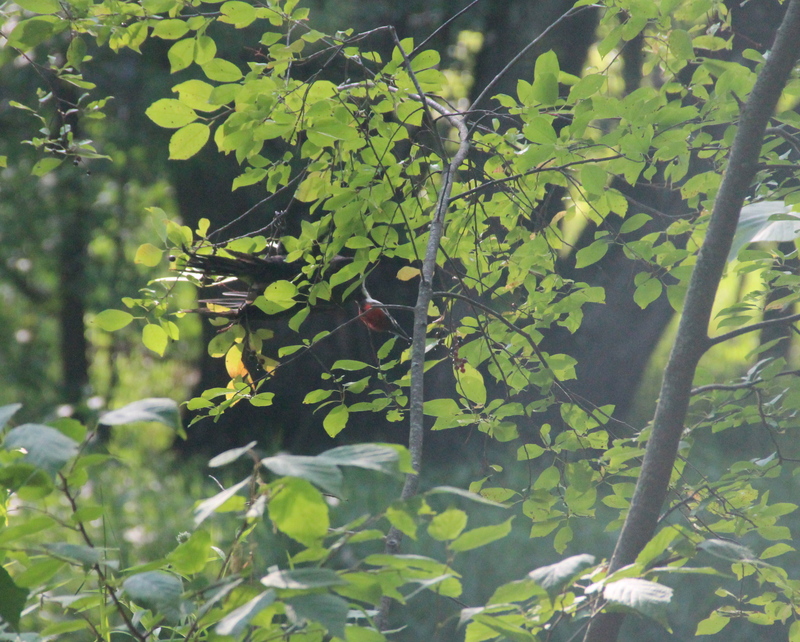 Her red crest glowed like a flame in the bush. Though pileated woodpeckers primarily eat insects such as carpenter ants and beetles found in bark, they also eat a variety of berries and fruit, and sometimes visit our backyard suet feeder in St. Paul, Minnesota. Our deck is just 6 feet from the bush, and if we were silent and still, the woodpecker payed no attention to us. When I tried to photograph her she flew immediately. As a result, I had to photograph her through the cabin windows, which reduced photo quality. 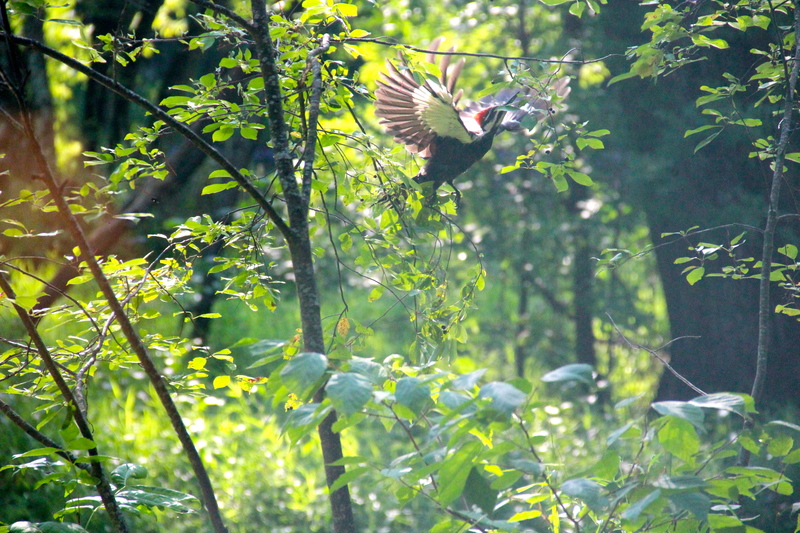 This entry was posted in Birds, Pine County, Snake River, MN, Wildlife and tagged Pileated woodpecker, Snake River MN. Bookmark the permalink. What a wonderful weekend for you, Beth! These photos are beautiful and I look forward to sharing your blog this year with our ecology club and also with the kids in the library. I love your pictures! Lisa,thank you for teaching your students about nature. I’m so glad that my blog is a tool that helps you!